Sasha is using Smore newsletters to spread the word online. 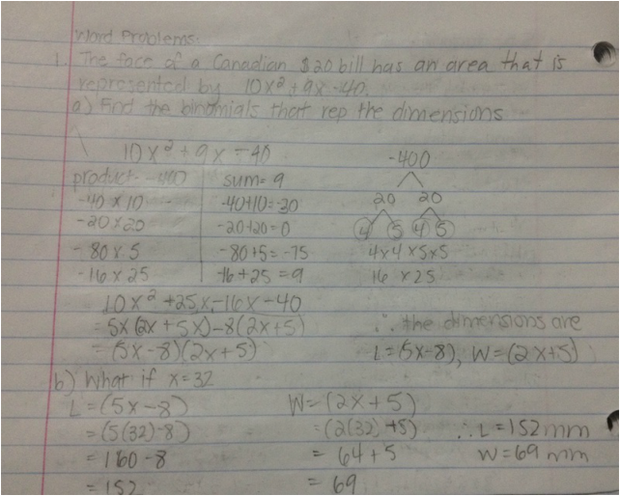 Everything You Need To Know About Grade 10 Quadratics! - What is a Quadratic? When is it useful? - Identifying transformations from the equation. - Writing an equation, given transformations and/or graph. What is a Quadratic and When is it useful? 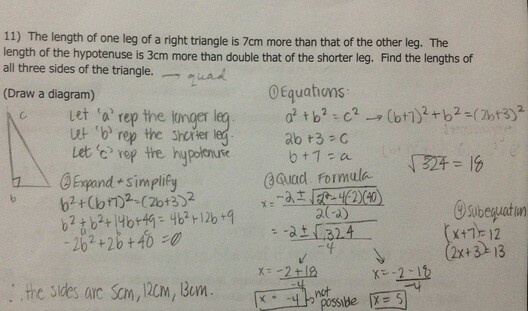 Quadratic comes from "quad" meaning square. This is because the variable gets squared (example: x²). A Quadratic relation is the opposite of a Linear relation, because the shape of the graph is always a curve, whereas in linear it is a straight line. Quadratics are graphed when creating graphs for profit or a function. Everyday quadratics include the flight of a ball or a firework, or a graph of total profit made in businesses. 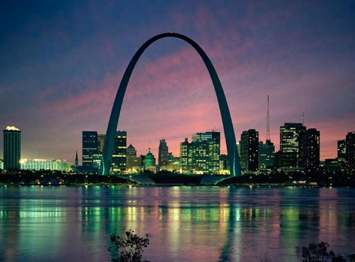 The shape made by the Quadratic function is also known as a Parabola. Vertex (x,y) -- the point where the parabola changes direction. The Optimal Value (OV)-- the y-value of the vertex. The Axis of Symmetry (AOS)-- the x-value of the vertex, and passes through the x-value. Zero--is/are the X-Intercept(s) of the parabola. Y-Intercepts-- is the point where the parabola touched the y-axis. M represents the slope, steepness and direction. B represents the y intercept and x=0 y=b. How can you tell whether an equation is a quadratic relation or a linear relation, just by looking at it? 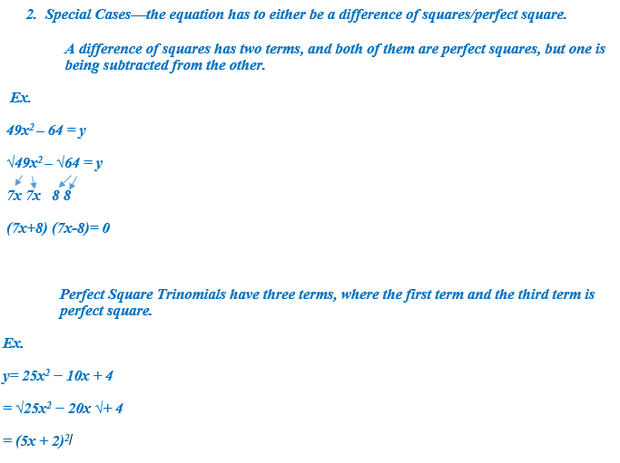 By looking at a table of values, you can easily see whether an equation is a quadratic relation or a linear relation. This is because, by doing first and second difference, you can determine the type of relation. If the first difference is constant (Image 1), then it is a linear relation. If the first difference isn't constant, but the second difference is (Image 2), then it is a quadratic relation. Standard Form is the original way to write the quadratic function. The equation could tell you the shape of the graph, the direction, and the y-intercept. 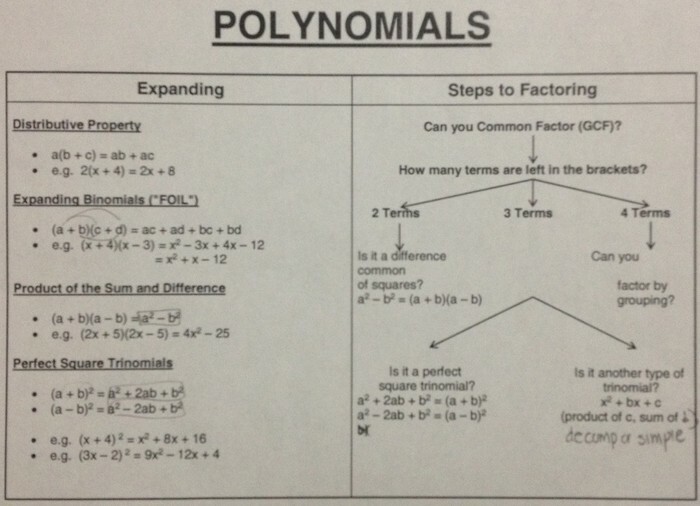 Factored Form is simplified version of the standard equation. By looking at the equation, you can see the shape and direction of the graph, and the x-intercepts or zeros. The vertex form allows you to see the different transformations that are applied to the base parabola of y=x². These transformations could be identified from the equation, when it is in Vertex Form. The value (-h) that is inside the bracket, is the horizontal translation. The value of h, moves the parabola either left or right depending or it's sign. (If the sign is negative, it moves right, if it is positive move left)--Opposite operation. The value of (k), is the vertical translation. It moves the parabola either up or down depending on the sign. (If the sign is negative, it moves down and if it is positive, it moves up). The value of (a), is either a vertical stretch or compression, by the factor of (a). It would be a stretch, if the number was a whole number. If the value was either a fraction or a decimal, then it would be a compression. If the value is negative, then it means that the parabola was reflected over the X-axis. 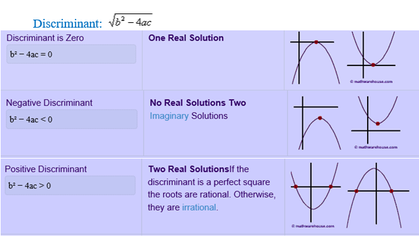 To solve a quadratic equation, means to find the x-intercept or the roots. There could be many possible solutions, however there would only be one y-intercept. To find the X-Intercept(s) or the Y-Intercept, set the opposite variable to 0. To graph a parabola that is in vertex form, you need to know the translations (of a, h and k), which is found in the equation. There are two methods on how to graph the vertex form; Mapping Notation and the Step Pattern. differences and similarities between a quadratic relation. - To find the y-intercepts (0,y), set x as 0, and solve for y. Perfect Squares -- when a binomial is squared. Difference of Squares-- when everything in both brackets is the same, except one is being added, and the other subtracted. Rule: First term squared, minus second term squared. 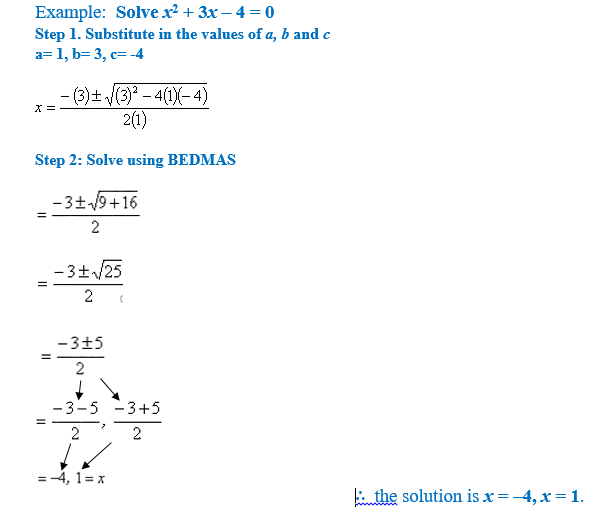 To see an example on how to graph factored form, click the link below. + bx + c = 0 . "a","b" and "c" are the known values "a" cannot be zero no matter what. "x" is the variable that is unknown. 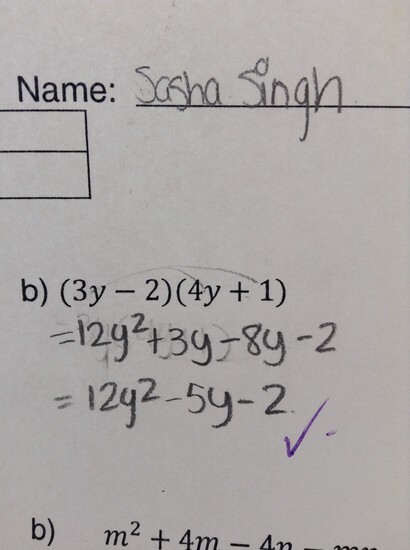 ... by completing the square. The discriminant is everything under the square root, by solving only this, you can know how many x-intercepts the equation will have. Find the x-intercepts of the equation, by using the quadratic formula. Find the vertex of the equation, by completing the square. 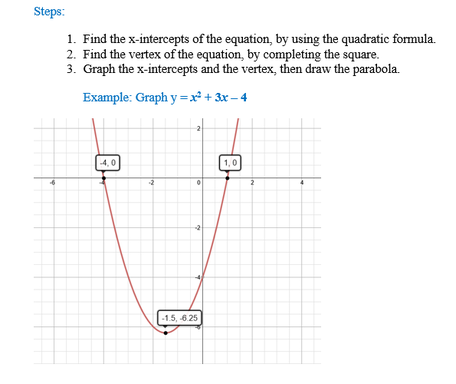 Graph the x-intercepts and the vertex, then draw the parabola. Overall, the quadratics unit was fairly easy. The Vertex form unit was really just the beginning, but it was also one of the easiest units. 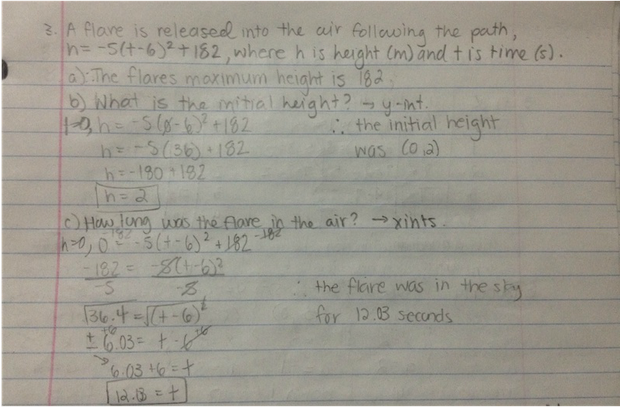 The concepts were easy to understand, and I put a lot of effort into understanding the concepts of the vertex form. Factored form was what scared me, I had heard a lot of things about the unit, like that not many people really liked it and that it was the "hardest" of the three units. At first, this was really true, I found it hard to distinguish between the many different ways to factor. At some point I found the factoring unit easy and some part confusing. The unit I hated the most was the Standard form unit, and this was because I was in the mindset that it was easy, and therefore was behind on the homework. Afterwards, I crammed all the homework on one day, and I ended up doing somewhat better throughout the unit.